75 AH Zero Turn Electric Riding Mower is rated 5.0 out of 5 by 4. The future of mowing has taken a turn. 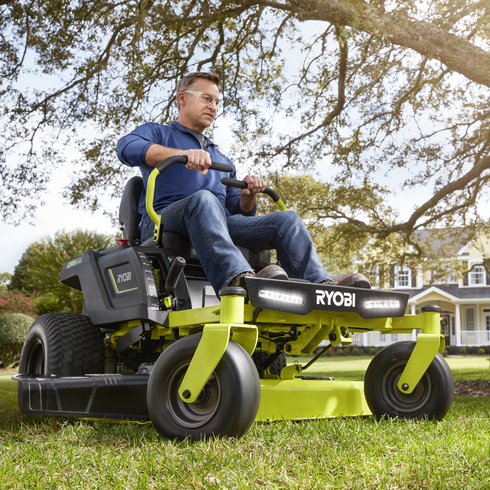 The RYOBI ZT480e Electric Riding Mower uses zero turn technology with lap bar steering to help cover more yard in less time. Cutting over 2 acres on 1 charge, it’s quietly and quickly changing the way America mows. A simple push of the lap bar steering delivers unrelenting torque directly to high-powered brushless motors. They quietly drive the wheels and blades, without the hassle of belts, spark plugs, gas and fumes. 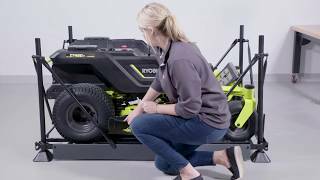 This feature-packed mower delivers extraordinary performance, convenience, comfort and durability. Surrender nothing but gas!